Texas Jet's customers have given us some very high honors over the years for our consistent, exceptional service. We clearly owe these achievements to our Ladies and Gentlemen who live our "Culture of Excellence" daily. THIRD YEAR IN A ROW !!! On May 18, 2016, Texas Jet was awarded the International Standard for Business Aircraft Handling (IS-BAH) certification. 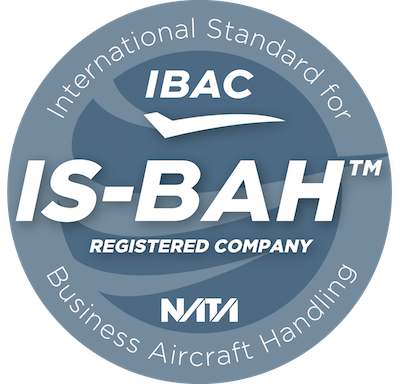 This prestigious accreditation awarded by the International Business Aviation Council (IBAC) marks Texas Jet's conformance to a recognized set of worldwide Industry Best Practices for business aviation ground handlers. The foundation of Texas Jet's Culture of Safety is our Safety Management System which, along with our Standard Operating Procedures and Emergency Response Plan, forms the basis for how we think and what we do. Extensive initial and recurrent training for all Texas Jet personnel means your aircraft will be in the safest, most capable hands in the industry. UPDATE - February, 2018 - Texas Jet achieves IS-BAH Stage II status! Our CULTURE OF SAFETY gets even better!